A powerful steam iron with 1,700 watts, this Rowenta model has a wide, stable base so you can rest it face down or sitting up. 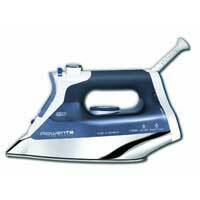 The stainless steel soleplate has 400 holes for even steam distribution and smooth gliding. Its variable steam options, including vertical, steam burst, and spray mist, get out even the toughest wrinkles with fewer passes of the iron. It’s a bit awkward to grip with the short handle. It’s on the expensive side at $89.99, but it features an easy-to-fill, extra-large water tank and a cord that pivots 360 degrees for convenience.